We stake to locations where flowering plants have been found in the past and place a flag there. This is the East Riley roadside remnant, an area with a lot of Echinacea close together and a high chance of getting mowed. When we find a new flowering Echinacea plant, we give it a tag and get its location with a survey-grade GPS (better than 6 cm precision). Then, we can revisit this plant for years to come and monitor its survival and reproduction. This season we added 5945 demo records and about 1375 survey records to our database. After over 20 years of this method, we now have a very rich longitudinal dataset of life histories including thousands of plants. 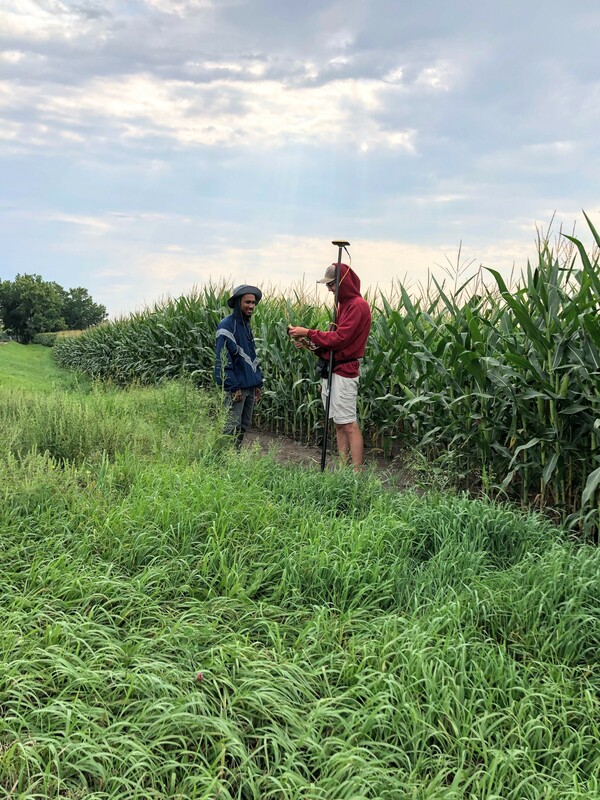 REU Will Reed was a huge help organizing demo tasks for Team Echinacea over the summer and helping out with demap (the demographic census database) during the year. We revisited locations in remnants where flowering plants were observed in previous years. 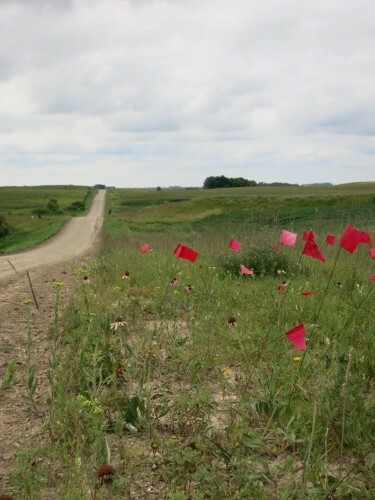 We tag each Echinacea plant we see flowering in our prairie remnants, and record its location using the GPS. This is useful because it allows us to revisit the same plant in future years, checking to see if it is still alive, and if so how large it is and whether or not it is flowering. This has provided us with a very rich longitudinal dataset of life histories, dating back two decades and including thousands of plants. 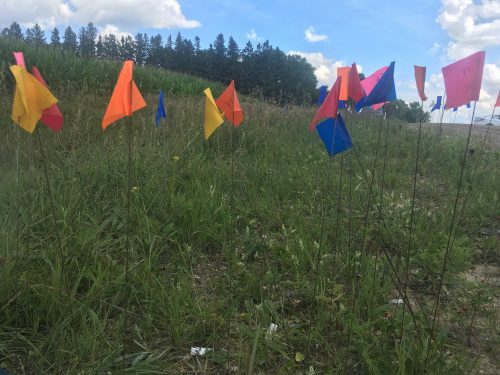 This year, we did total demo, visiting each plant in our database, at several sites including Staffanson, Loeffler’s Corner East, Northwest of Landfill, and East Elk Lake Road. In the interest of time, we only did flowering demo (only visiting plants that flowered this year) at several sites, including Landfill, Around Landfill, and Railroad Crossing. For each plant visited, we recorded its status (e.g., basal, flowering), its number of rosettes, and any neighboring Echinacea within a 12 cm radius. This data can be used to study inter-annual variation in flowering, population dynamics, and response to fire. GPS points shot: Points for each flowering plant this year shot mostly in PHEN records, stored in surv.csv. Some points of flowering plants stored in SURV records, also in surv.csv. Each location should be either associated with a loc from prior years or a point shot this year. Hi Flog! It’s me, Amy! This winter we’ve been working on ‘demap’, a project to coordinate 20+ years of demography and spatial data from remnant populations of Echinacea in Solem Township. When we are done we will have a great long-term dataset of over 3000 individuals in 27 remnant populations. We can use that information to answer all kinds of questions about flowering dynamics in natural populations, population growth, and the consequences of disturbances such as habitat fragmentation and fire! In particular, this January we focused our efforts on answering questions about the demographic consequences of fire. Does fire’s stimulation of flowering contribute to increased population growth over the long term? Do reproductive benefits of fire outweigh potential survival costs? We’re not sure, but we hope to find out by analyzing four populations– a large population that had one fire event, a large population that has not been burned in the past 20 years, a small population that burned once, and a small population that has not burned in the past 20 years. We’ll combine our demography data about flowering and survival with other information, such as the seedling recruitment and remnant seed set data, to project population growth. Will was here to help out with the project in the first two weeks of January. We got a lot done with demap and made meaningful progress on other big questions such as “Is kale overrated?” and “What does overrated mean statistically?”. We also made big strides in terms of professional development by studying business mogul DJ Khaled’s keys to success. Stay tuned for updates! Demap is a team effort! In this shot, we are helping Will find a plant on the computer. Today was probably the coldest day of fieldwork we have had all summer, a cold front passed through on Wednesday and left us with a cloudy 60 degree day. For those team members who are more accustomed to hotter summers today was a little bit of a shock. We went out to do total demography at Staffanson Praire Preserve, our goal while doing total demo is to census all of the plants that have flowered sometime in the last 20 years. It’s a big project, at Staffanson alone there are just over one thousand locations to visit. While not all of these locations still have a plant it is awesome to see a tag around a plant that was put there in 1996 or 1997. Even the flowers are cold! We made a huge dent in the number of locations at Staffanson, of the 1054 locations we visited 435, nearly half done! Here is a proposal for a fun project. It involves using demography data from this (and prior) years to estimate the growth rates of each of the remnants individually. Actually, that’s basically the whole project. Action items for the next month include: reading technical manuals with specifics on implementing aster models (see the list of project publications if you want to read them for me on your own). In other Scott-research related news, I will also try modeling fitness of various Hesperostipa spartea crosses in experimental plot 1. Just today I got a list of positions of plants found alive in 2016 — my plan in the near future is to search positions in the plot where plants were found alive in 2011 but weren’t found in 2016 to assess mortality. Keep your eyes open for another action-packed research proposal for this porcupine grass-ey project. 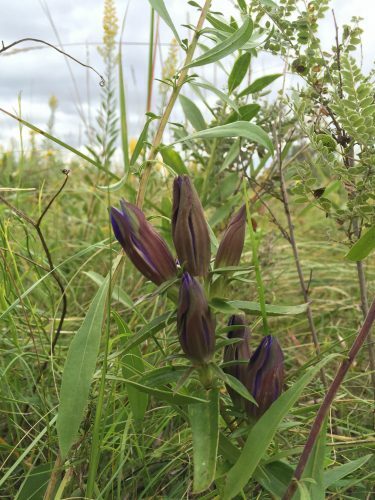 In 2015, we continued to gather demographic information on Echinacea angustifolia in remnant prairie populations. We went to 32 remnant prairies ranging size from 1 flowering plant to 289 flowering plants. 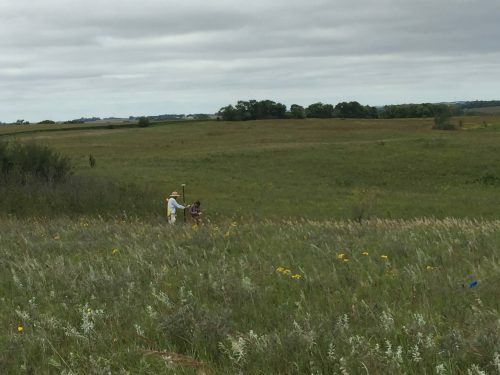 This year at our largest site, the Staffanson Prairie Preserve, we collected demographic information on 318 individual plants including 175 flowering plants. Across all the sites, we found 1561 flowering plants and visited a total of 1889 plants. For each plant that we visit, we record whether the plant is alive, whether the plant is flowering, and how many flowering heads it produces. We currently have former team member Lydia English and current team member Will Reed working on organizing the previous 20 years of data using methods that Stuart, Jared, and Gretel developed last year. So far we have organized data from 2010-2015 (years we used GPS units) in 10 sites and data for all 1995-2015 for Staffanson Prairie Preserve. 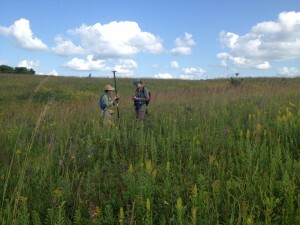 Project “demap” – organized survey, demography, and phenology data. With over 15 years of data, the study of Echinacea demography is among the Echinacea Project’s longest running research projects. 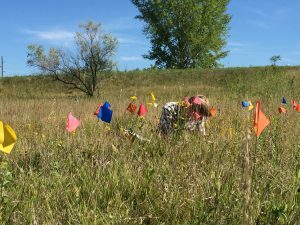 During demography, Team Echinacea maps and collects basic demographic information about plants within 30 prairie remnants. 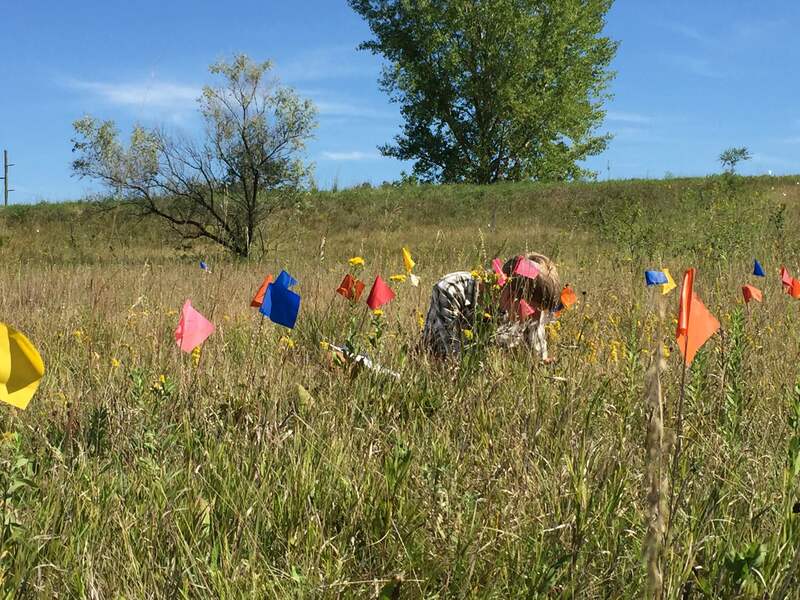 In 2014 we collected demographic information for over 500 individual plants including 179 flowering plants at our largest site, Staffanson Prairie Preserve, alone. Across the other 29 sites, we found 897 flowering plants and visited a total of 1226 plants. For each plant visited, we recorded whether the plant was alive, whether the plant was flowering, and how many flowering heads it produced. With this extensive dataset, we hope to explore inter-annual flowering patterns, assess longitudinal plant fitness, and monitor numerical population dynamics in remnant populations of Echinacea. Products: Stuart, Jared, and Gretel are working to clean, organize, and integrate demography, survey, and phenology data (project “demap”). Also see the demography protocol. This afternoon the whole team ventured out to Staffanson prairie and collected demographic information on Echinacea plants. In addition to the 140 plants already flagged for phenology, we staked and collected data on roughly 200 additional plants! While we put a substantial dent in the demography we need to do at Staffanson this afternoon, we still have a ways to go. Between 2010 and 2014 Team Echinacea mapped 1074 points, including 649 unique tag numbers. We will revisit all of these plants this summer in order to continue building a longitudinal demographic database. I attached a graph to illustrate the temporal distribution of Echinacea tags at Staffanson. Note that all tags in the 19000s were placed in 2014, tags in the 18000s were placed in 2013, and tags in the 17000s were placed in 2012, etc. We have 410 unique tag numbers placed between 1996 and 2009 on our list of plants to stake!